I have recently finished a couple of nice reads. Thanks to Karen, who loaned this to me. I dont have much more to say about this lovely story, except I agree with other bloggers who have done extremely good reviews. See Bookbath, A Readers Journal, Farmlane Books, and A Fondness for Reading. Another easy and fun read, 44 Scotland Street by Alexander McCall Smith. This one I will send to my niece, who should be studying, but is easily distracted by anything related to her up and coming trip to Edinburgh to go to uni. Again, many other good bloggers have reviewed this and all I can say is I dont like Bruce, I do like Pat and Dominica, and I think Irene should go to therapy herself. I still dont know where the car is, who the Edinburgh Society is, or if the painting is a French Impressionist, or Bearties impressions of where his car is????? Our resident Kookaburra sits on the clothes line waiting for something to pop up out of the garden for lunch. We're very lucky to have these friends in our suburban garden, because they help us manage bugs like the solder grub that can destruct a lawn in 24 hours. This weekends gardening activities are concentrated on garden recovery. Last weekend my partner had some friends around to play chainsaws. They radically pruned the 15 meter Jacaranda that was blocking the sun and rain from the garden area. This also involved rearranging the hills hoist clothesline (as pictured above in it's pre- altered state) and crushing the gardens dog-proof fences. I cant fix the clothes line, but I have fixed the fences and cleaned up the other garden plants affected by the event. I notice this morning that the banana (single) that my partner brought inside last week has now turned yellow, so I'm off to look at how the rest of the bunch is going after this blog. This weeks pickings included: carrots, zucchini, rhubarb, beans, spinach and bok choy and fruits - guava and icecream beans (inga bean). Sadly while this looks like a great list, none of my vegies are looking full bodied or healthy. I have to do some research on what to feed the garden at this time of year. To gather beans, carrots, spinach and bokchoy for this weeks menu. Sorry there's no pictures of the garden this week - it looks shocking after the chainsaw masacre. Nest week will be better. 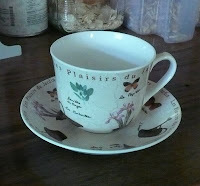 This tea cup and saucer was a 'just because' gift from my friend Sarah, who knows how much I enjoy my garden, french things and Tea Cups... Thanks Sarah. 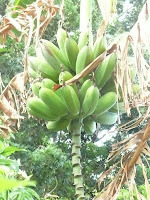 I know I don't have many followers who garden Banana's, but I am very proud of this bunch. It seems like very slow progress but they are still growing. I think my November blog provides a good measuring stick, back when it was just the flower. Pepper is my oldest, she's an Australian Blue Health Cattle Dog cross with Boarder Collie, and she's appearing today to welcome Pyewackett, who has joined Max at La Ferme De Sourou. While my Pepper doesn't last long at 'work' these days, looks like Pyewackett and Max will be a great pair of working dogs. Many Many thanks to Karen at Bookbath, for giving me this award. 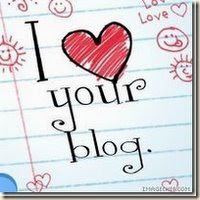 Karen has been one of my primary blogging and reading inspirations for years now, and I'm honoured she 'loves' my blog. She said she loves it because it "always challenges and informs me about broader issues in the world." That's alot to live up to. Aplaca, Chook, Garden, Travel and Michelle's Musings because Michelle muses on things I like. Jacqui from Life in the Dome: A blog about chooks because she has interesting projects going on all the time and tells a good story. Abby at Good'N'Planty because she does give aways and blogs about interesting things like what she's cooking or how she thinks about catching mice! Riana at These days in French Life becuase I love her 'slow life' philosophy, her ingenuity, and life in France. Robin at A Fondness fro Reading because I like her weekly quotes, her idea's and the fact she supports her mom's blog. Bellezza at Dolce Bellezza who wins lots of awards, but I cant see she's got this one yet this year, and I do Love her blog for variety, honesty and generousity. Jess at This delicious Solitude because I love the blog name and she reads in a different world to me and writes wonderful reviews. Of Course Karen, it goes without saying, that if I had 8 spots I would send this one back to you too. Earlier this year I read on someones blog, and I'm sorry I cant remember who, but I picked up on the idea of supporting the independent bookshops. While I like the ease of browsing in Boarders, I do like the ethical concept of supporting the small business. So when I was visiting Balmain earlier this year, I wandered into a lovely bookstore called Hill of Content and here I found Frida's Bed: A Novel. I choose it as one of my 'Lost in Translation' books. Author: Slavenka Drakulic was born in Croatia in 1949. She's written feminist critiques of communism which brought her to the attention of the public in the west, and other books about the war in her homeland and novels. Translated from Croatian by Christina P. Zoric. My Synopsis: The author chose to base her novel on the real life artist Frida Kahlo, who was diagnosed with polio in Mexico at the age of six. The story, which draws on some of the real artworks and life events of Frida, is expanded by the authors imaginings of what was going through Frida's mind through significant stages of her short life. Frida experiences a second disabling accident in you late youth, and her life is filled with chronic pain, ongoing ill health and emotional upheavals of love. Frida's spirit demands that she fight the pain, and she's motivated to live through her art. As a novel, I believe that Drakulic has woven some her feminist idea's into Frida's story - expounding of the idea's of women as carers, lovers, artisans and demonstrating to power of women in the political environment. Physical pain does not simply resist language but actively destroys it, bringing about an immediate reversion to a state anterior to language, to sounds and cries a human being makes before language is learned. (Elaine Scarry, The body of Pain.) Intro page. All she had Left was random, unreliable memories. And her memory seemed like a fin cobweb. She still managed to hold her balance on the tin thread between two points, in the faint hope that she would eventually she the entire cobweb, that her life would turn out to have had a meaningful structure after all. Page 68. A painful body, an unwanted body. I suffered on both counts. I was not only in pain, I had been rejected as well. However hard I tried, I never quite managed to separate myself from my body. I never succeeded in becoming a butterfly.How much easier it would have been for me if only I had believed in God and in devil, in heaven and hell, in the immortality of the soul. Page 91. Suddenly she remembered that before her last encounter with death, almost thirty years earlier, she had licked her lips with the taste of an orange. She had been alive, so unforgetably alive. Page 162. Concluding thoughts: I enjoyed this story for two reasons - I encountered another woman's life, Frida, although no longer with us, is famous and a reknowned artist. Secondly, I believe that women share similar struggles, regardless of disability, with self identity and relationships. Frida's Bed hold's many wonderful insights about these struggles. I dont normally re-read books, but I could revisit this at other times in my life, and see totally different messages. Recommended reading for lovers of art, for women, and anyone who is prepared to empathise with the human experience of relationships. Today I enjoy tea and toast on my back varandah with my dogs, over looking a slightly neglected lawn and garden. I was called away at very short notice on Feb 19th by an organisation I do voluntary work with, and after 11 days away I returned home last Sunday only to be back at work Monday. This weekend, and my tea and toast, has been long over due in my book. I love this mug, which I purchased on one my trips to visit one of my best friends in California. The mug is slightly quirky with it's Flamingo's but very comforting in it's shape and size. It's just what the dr ordered this morning. So later today, I will review the book Frida's Bed, provide some garden updates (including news about banana's) and review the blog improvement project. I am also looking forward to catching up on some of your blogs, which I missed during my absence.